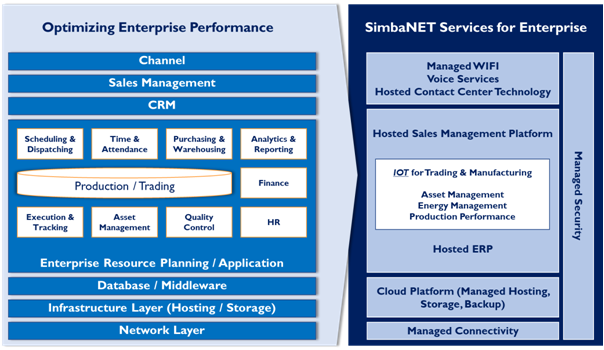 At SimbaNET, our focus is on increasing the speed, agility and profitability at every phase of enterprise business environment. We are continuously evolving towards developing & deploying new flexible and secure communication opportunities between locations, people and machines to improve operational efficiency. Establish seamless connectivity in between your Offices, Branches and Remote locations. The service includes offering Data, Internet & Voice; connecting over Fiber, VSAT and WiMAX. End to End Deployment, Monitoring and Management of WAN and WIFI network. You can be fully assured of quality and a lower total cost of ownership. Our Hosted ERP solution enables you to optimize processes, streamline efficiencies and drive productivity across key departments. These benefits make our ERP system a crucial investment for many modern enterprises. We have collaborated with niche partners in IOT space for Sensors and M2M communication; this has enabled us to offer tailor-made IOT solution with right-fit for your manufacturing and trading environment. With our local Voice Switch we are providing interconnection with local and International carriers using SIP technology. You can save more than 40% on your monthly Voice Communication cost.